Chronic granulomatous disease (CGD), an inherited disorder of phagocytic cells, results from an inability of phagocytes to produce bactericidal superoxide anions (O2-). This consequently interferes with the production of hydrogen peroxide (H2O2), hypochlorous acid (HOCI), and hydroxyl radicals (OH. ), products that play a critical role in killing certain pathogenic bacterial and fungal agents. These deficits lead to recurrent, life-threatening bacterial and fungal infections. In addition, most patients with CGD have dysregulated T helper (Th)-17 lymphocyte–controlled inflammation. Since its first description in the 1950s as a syndrome of recurrent infections, hypergammaglobulinemia, hepatosplenomegaly, and lymphadenopathy in males who invariably died in the first decade of life, notable advances have been made in the understanding of this disease. The outlook for affected patients has also improved. Chronic granulomatous disease is now known to be caused by a defect in the nicotinamide adenine dinucleotide phosphate (NADPH), reduced form, oxidase enzyme complex of phagocytes. Chronic granulomatous disease refers to the characteristic granulomas that develop in response to chronic inflammation. In response to phagocytosis, normally neutrophils increase their oxygen consumption, which has been termed the respiratory or oxidative burst. The clinical significance of the respiratory burst was made evident when neutrophils from patients with chronic granulomatous disease were shown to have a lack of increased oxygen consumption. Chronic granulomatous disease is caused by a defect in phagocytic NADPH oxidase, which is responsible for producing O2-. This superoxide anion is then converted to relatively bactericidal reactive oxidants, such as hydroxyl radical (OH-), hydrogen peroxide (H2 O2), peroxynitrite anion (ONOO-), and oxyhalides (HOX-, in which the X moiety is most commonly chlorine). The superoxide anion is generated by transferring electrons from the reduced NADPH to molecular O2 in response to physiologic stimuli, such as phagocytosis. This reaction is mediated by the phagocyte NADPH oxidase otherwise known as phagocyte oxidase (phox). Nitric oxide (NO) and other reactive nitrogen intermediates have a prominent microbicidal role in experimental animals but do not appear to have a critical role in human phagocytes. The phox system is an NADPH oxidase enzyme complex consisting of 5 component proteins. Glycoprotein 91 (gp91) and protein 22 (p22) make up the b and a subunits of a membrane bound heterodimer referred to as flavocytochrome b558. Protein 47 (p47), protein (p67), and protein 40 (p40) exist together as the cytosolic components of phox. The membrane-bound (gp91 and p22) and cytosolic components (p47, p67, and p40) assemble at the phagolysosome membrane in response to inflammatory stimuli such as phagocytosis. The assembled enzyme complex transports electrons from cytosolic NADPH across the membrane to molecular oxygen inside the phagolysosome to generate superoxide and other more toxic radicals, such as hydrogen peroxide mediated by superoxide dismutase and HOX. The precise mechanism by which this intracellular bleach kills microorganisms is still debated. Numerous additional cytosolic oxidase factors (rac1, rac2) and a membrane-associated factor, rap1A, have been identified as having important roles in oxidase activation and function. Chronic granulomatous disease results from defects in gp91, p22, p47, and p67. Thus far, no cases related to a defect in p40 have been reported. An immunodeficiency syndrome similar to chronic granulomatous disease was described in one patient secondary to a mutation involving rac2 (guanosine triphosphate [GTP]–bound signaling protein). The most common molecular defect in chronic granulomatous disease is a mutation in the CYBB (cytochrome B, b subunit) gene that is located on the X chromosome and that encodes for gp91 (the b subunit of cytochrome b558). The resulting syndrome is commonly called X-linked chronic granulomatous disease (X-CGD). Gp91 deficiency accounts for 50-70% of all cases of chronic granulomatous disease. More than 350 mutations in the CYBB gene are known, and thus far, all are unique to individual families. Data from analyses of carriers suggests that de novo mutations occur in about 10% of cases. The second most common mutation occurs in the NCF1 gene on chromosome 7 that encodes for p47. This mutation is the most common autosomal recessive form of the disease, accounting for 20-40% of all cases of chronic granulomatous disease. Unlike CYBB which has more than 350 mutations, the NCF1 mutation is highly conserved to a single deletion in more than 90% of patients. Mutations in the genes NCF2 (which encodes p67) and CYBA (which encodes p22) are rare, accounting for fewer than 10% of all cases of chronic granulomatous disease. Both of these mutations result in the autosomal recessive forms of chronic granulomatous disease. About 95% of the mutations mentioned above result in complete absence or greatly diminished level of the affected protein. In the remaining 5%, a normal level of defective protein is produced. The 4 forms of the disease are referred to as X91 (X-linked, gp91), A22 (autosomal, p22), A47, and A67 CGD. The superscript+,-, oro is added to denote a normal level, a reduced level, or complete absence of the affected subunit. Less than 10% of patients have the X-linked variant form of CGD (X91-), which has a relatively mild clinical course. Most of these patients have low but detectable levels of flavocytochrome b588, and their phagocytes can generate measurable amounts of superoxide. Defects in p47 also seem to be associated with enzymatic and clinical deficiency less profound than that observed in other forms. Diagnosis in adulthood is not uncommon in these patients with residual phox activity. Fungal infections occur in as many as 20% of patients with chronic granulomatous disease. 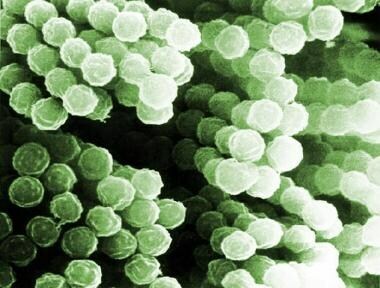 The most common pathogens are Aspergillus fumigatus, Torulopsis glabrata (ie, Candida glabrata), and Candida albicans.Pneumonia is the most common presentation of fungal infection. Aspergillus nidulans, which is a rare pathogen in other patient populations, has emerged as a problematic pathogen in chronic granulomatous disease. It causes locally invasive or disseminated disease that is more lethal than that caused by A fumigatus. In a review of a registry of patients with chronic granulomatous disease, Aspergillus infection was the leading cause of death (see the image below), and B cepacia infection was the second most common. The diagnosis of chronic granulomatous disease should be considered in any patient with recurrent infections with catalase-positive organisms; infections with unusual organisms such as Serratia marcescens, A nidulans, or B cepacia; or infections in sites normally considered to be rare in children, such as a Staphylococcus aureus infection in a liver abscess. Sepsis is a common cause of death in CGD. The exact incidence of chronic granulomatous disease (CGD) is unknown. Analysis of data submitted to a national registry suggests that the incidence of CGD in the United States is about 1 case per 200,000-250,000 population (as many as 20 patients with CGD are born each year), with no apparent racial or ethnic predilection. About two thirds of cases are inherited as X-linked defects, and the remaining cases are inherited in autosomal recessive fashion. Of the 368 patients from 318 kindreds reported to the chronic granulomatous disease registry, 316 (86%) were male. Although the vast majority of affected individuals present with infections in early childhood, several reports describe affected patients who became symptomatic later than this. Chronic granulomatous disease is probably undiagnosed in some patients because they have a clinically mild phenotype. von Rosenvinge EC, O'Donnell TG, Holland SM, Heller T. Chronic granulomatous disease. Inflamm Bowel Dis. 2009 Mar 25. [Medline]. Thomsen IP, Smith MA, Holland SM, Creech CB. A Comprehensive Approach to the Management of Children and Adults With Chronic Granulomatous Disease. J Allergy Clin Immunol Pract. 2016 May 10. [Medline]. Ko SH, Rhim JW, Shin KS, Hahn YS, Lee SY, Kim JG. Genetic analysis of CYBB gene in 26 korean families with X-linked chronic granulomatous disease. Immunol Invest. 2014. 43(6):585-94. [Medline]. Ben-Ari J, Wolach O, Gavrieli R, Wolach B. Infections associated with chronic granulomatous disease: linking genetics to phenotypic expression. Expert Rev Anti Infect Ther. 2012 Aug. 10(8):881-94. [Medline]. Vining M, Sharma N, Guill M. Atypical presentation of chronic granulomatous disease with Burkholderia cepacia. BMJ Case Rep. 2014 Aug 6. 2014:[Medline]. Roos D, Kuhns DB, Maddalena A, et al. Hematologically important mutations: the autosomal recessive forms of chronic granulomatous disease (second update). Blood Cells Mol Dis. 2010 Apr 15. 44(4):291-9. [Medline]. van den Berg JM, van Koppen E, Ahlin A, et al. Chronic granulomatous disease: the European experience. PLoS One. 2009. 4 (4):e5234. [Medline]. [Full Text]. Marciano BE, Rosenzweig SD, Kleiner DE, et al. Gastrointestinal involvement in chronic granulomatous disease. Pediatrics. 2004 Aug. 114(2):462-8. [Medline]. Xu H, Tian W, Li SJ, Zhang LY, Liu W, Zhao Y, et al. Clinical and molecular features of 38 children with chronic granulomatous disease in mainland china. J Clin Immunol. 2014 Aug. 34(6):633-41. [Medline]. Jones LB, McGrogan P, Flood TJ, Gennery AR, Morton L, Thrasher A. Special article: chronic granulomatous disease in the United Kingdom and Ireland: a comprehensive national patient-based registry. Clin Exp Immunol. 2008 May. 152(2):211-8. [Medline]. Cole T, McKendrick F, Titman P, Cant AJ, Pearce MS, Cale CM, et al. Health Related Quality of Life and Emotional Health in Children with Chronic Granulomatous Disease: A Comparison of Those Managed Conservatively with Those That Have Undergone Haematopoietic Stem Cell Transplant. J Clin Immunol. 2012 Aug 12. [Medline]. Ahlin A, Fasth A. Chronic granulomatous disease - conventional treatment vs. hematopoietic stem cell transplantation: an update. Curr Opin Hematol. 2014 Nov 12. [Medline]. Shigemura T, Nakazawa Y, Hirabayashi K, Kobayashi N, Sakashita K, Agematsu K, et al. Dramatic Improvement in the Multifocal Positron Emission Tomography Findings of a Young Adult with Chronic Granulomatous Disease Following Allogeneic Hematopoietic Stem Cell Transplantation. J Clin Immunol. 2014 Nov 4. [Medline]. Mouy R, Veber F, Blanche S, et al. Long-term itraconazole prophylaxis against Aspergillus infections in thirty-two patients with chronic granulomatous disease. J Pediatr. 1994 Dec. 125(6 Pt 1):998-1003. [Medline]. Walsh TJ, Anaissie EJ, Denning DW, et al. Treatment of aspergillosis: clinical practice guidelines of the Infectious Diseases Society of America. Clin Infect Dis. 2008 Feb 1. 46(3):327-60. [Medline]. Sfaihi L, Maaloul I, Fourati H, Stasia MJ, Mnif Z, Hachicha M. Resistant Invasive Aspergillosis in an Autosomal Recessive Chronic Granulomatous Disease. Fetal Pediatr Pathol. 2012 Sep 24. [Medline]. Gallin JI, Alling DW, Malech HL, et al. Itraconazole to prevent fungal infections in chronic granulomatous disease. N Engl J Med. 2003 Jun 12. 348(24):2416-22. [Medline]. International Chronic Granulomatous Disease Cooperative Study Group. A controlled trial of interferon gamma to prevent infection in chronic granulomatous disease. The International Chronic Granulomatous Disease Cooperative Study Group. N Engl J Med. 1991 Feb 21. 324(8):509-16. [Medline]. Marciano BE, Wesley R, De Carlo ES, et al. Long-term interferon-gamma therapy for patients with chronic granulomatous disease. Clin Infect Dis. 2004 Sep 1. 39(5):692-9. [Medline]. Miki M, Ono A, Awaya A, et al. Successful bone marrow transplantation in chronic granulomatous disease. Pediatr Int. 2009 Dec. 51(6):838-41. [Medline]. Seger RA. Modern management of chronic granulomatous disease. Br J Haematol. 2008 Feb. 140(3):255-66. [Medline]. Feingold PL, Quadri HS, Steinberg SM, et al. Thoracic Surgery in Chronic Granulomatous Disease: a 25-Year Single-Institution Experience. J Clin Immunol. 2016 Aug 6. [Medline]. Liese JG, Jendrossek V, Jansson A, et al. Chronic granulomatous disease in adults. Lancet. 1996 Jan 27. 347(8996):220-3. [Medline]. Barton LL, Moussa SL, Villar RG, Hulett RL. Gastrointestinal complications of chronic granulomatous disease: case report and literature review. Clin Pediatr (Phila). 1998 Apr. 37(4):231-6. [Medline]. Berendes H, Bridges RA, Good RA. A fatal granulomatosus of childhood: the clinical study of a new syndrome. Minn Med. 1957 May. 40(5):309-12. [Medline]. Bjorgvinsdottir H, Ding C, Pech N, et al. Retroviral-mediated gene transfer of gp91phox into bone marrow cells rescues defect in host defense against Aspergillus fumigatus in murine X-linked chronic granulomatous disease. Blood. 1997 Jan 1. 89(1):41-8. [Medline]. Carson MJ, Chadwick DL, Brubaker CA, et al. Thirteen boys with progressive septic granulomatosis. Pediatrics. 1965 Mar. 35:405-12. [Medline]. Danziger RN, Goren AT, Becker J, et al. Outpatient management with oral corticosteroid therapy for obstructive conditions in chronic granulomatous disease. J Pediatr. 1993 Feb. 122(2):303-5. [Medline]. Del Giudice I, Iori AP, Mengarelli A, et al. Allogeneic stem cell transplant from HLA-identical sibling for chronic granulomatous disease and review of the literature. Ann Hematol. 2003 Mar. 82(3):189-92. [Medline]. Dohil M, Prendiville JS, Crawford RI, Speert DP. Cutaneous manifestations of chronic granulomatous disease. A report of four cases and review of the literature. J Am Acad Dermatol. 1997 Jun. 36(6 Pt 1):899-907. [Medline]. Gallin JI, Malech HL. Update on chronic granulomatous diseases of childhood. Immunotherapy and potential for gene therapy [clinical conference]. JAMA. 1990 Mar 16. 263(11):1533-7. [Medline]. Goebel WS, Mark LA, Billings SD, et al. Gene correction reduces cutaneous inflammation and granuloma formation in murine X-linked chronic granulomatous disease. J Invest Dermatol. 2005 Oct. 125(4):705-10. [Medline]. Gorlach A, Lee PL, Roesler J, et al. A p47-phox pseudogene carries the most common mutation causing p47-phox-deficient chronic granulomatous disease. J Clin Invest. 1997 Oct 15. 100(8):1907-18. [Medline]. Heyworth PG, Cross AR, Curnutte JT. Chronic granulomatous disease. Curr Opin Immunol. 2003 Oct. 15(5):578-84. [Medline]. Ishibashi F, Nunoi H, Endo F, et al. Statistical and mutational analysis of chronic granulomatous disease in Japan with special reference to gp91-phox and p22-phox deficiency. Hum Genet. 2000 May. 106(5):473-81. [Medline]. Jirapongsananuruk O, Malech HL, Kuhns DB, et al. Diagnostic paradigm for evaluation of male patients with chronic granulomatous disease, based on the dihydrorhodamine 123 assay. J Allergy Clin Immunol. 2003 Feb. 111(2):374-9. [Medline]. Johnston RB. Clinical aspects of chronic granulomatous disease. Curr Opin Hematol. 2001 Jan. 8(1):17-22. [Medline]. Kamani N, August CS, Campbell DE, et al. Marrow transplantation in chronic granulomatous disease: an update, with 6-year follow-up. J Pediatr. 1988 Oct. 113(4):697-700. [Medline]. Kume A, Dinauer MC. Gene therapy for chronic granulomatous disease. J Lab Clin Med. 2000 Feb. 135(2):122-8. [Medline]. Landing BH, Shirkey HS. A syndrome of recurrent infection and infiltration of viscera by pigmented lipid histiocytes. Pediatrics. 1957 Sep. 20(3):431-8. [Medline]. Leung T, Chik K, Li C, Yuen P. Bone marrow transplantation for chronic granulomatous disease: long- term follow-up and review of literature. Bone Marrow Transplant. 1999 Sep. 24(5):567-70. [Medline]. Malech HL. Progress in gene therapy for chronic granulomatous disease. J Infect Dis. 1999 Mar. 179 Suppl 2:S318-25. [Medline]. Malech HL, Nauseef WM. Primary inherited defects in neutrophil function: etiology and treatment. Semin Hematol. 1997 Oct. 34(4):279-90. [Medline]. Margolis DM, Melnick DA, Alling DW, Gallin JI. Trimethoprim-sulfamethoxazole prophylaxis in the management of chronic granulomatous disease. J Infect Dis. 1990 Sep. 162(3):723-6. [Medline]. Meischl C, Roos D. The molecular basis of chronic granulomatous disease. Springer Semin Immunopathol. 1998. 19(4):417-34. [Medline]. Mouy R, Fischer A, Vilmer E, et al. Incidence, severity, and prevention of infections in chronic granulomatous disease. J Pediatr. 1989 Apr. 114(4 Pt 1):555-60. [Medline]. Nakhleh RE, Glock M, Snover DC. Hepatic pathology of chronic granulomatous disease of childhood. Arch Pathol Lab Med. 1992 Jan. 116(1):71-5. [Medline]. Ochs HD, Igo RP. The NBT slide test: a simple screening method for detecting chronic granulomatous disease and female carriers. J Pediatr. 1973 Jul. 83(1):77-82. [Medline]. Rae J, Newburger PE, Dinauer MC, et al. X-Linked chronic granulomatous disease: mutations in the CYBB gene encoding the gp91-phox component of respiratory-burst oxidase. Am J Hum Genet. 1998 Jun. 62(6):1320-31. [Medline]. Rosen GM, Pou S, Ramos CL, et al. Free radicals and phagocytic cells. FASEB J. 1995 Feb. 9(2):200-9. [Medline]. Schapiro BL, Newburger PE, Klempner MS, Dinauer MC. Chronic granulomatous disease presenting in a 69-year-old man. N Engl J Med. 1991 Dec 19. 325(25):1786-90. [Medline]. Segal BH, DeCarlo ES, Kwon-Chung KJ, et al. Aspergillus nidulans infection in chronic granulomatous disease. Medicine (Baltimore). 1998 Sep. 77(5):345-54. [Medline]. Segal BH, Leto TL, Gallin JI, et al. Genetic, biochemical, and clinical features of chronic granulomatous disease. Medicine (Baltimore). 2000 May. 79(3):170-200. [Medline]. Thrasher AJ, Keep NH, Wientjes F, Segal AW. Chronic granulomatous disease. Biochim Biophys Acta. 1994 Oct 21. 1227(1-2):1-24. [Medline]. Vowells SJ, Fleisher TA, Sekhsaria S, et al. Genotype-dependent variability in flow cytometric evaluation of reduced nicotinamide adenine dinucleotide phosphate oxidase function in patients with chronic granulomatous disease. J Pediatr. 1996 Jan. 128(1):104-7. [Medline]. Weening RS, Kabel P, Pijman P, Roos D. Continuous therapy with sulfamethoxazole-trimethoprim in patients with chronic granulomatous disease. J Pediatr. 1983 Jul. 103(1):127-30. [Medline]. Weening RS, Leitz GJ, Seger RA. Recombinant human interferon-gamma in patients with chronic granulomatous disease--European follow up study. Eur J Pediatr. 1995 Apr. 154(4):295-8. [Medline]. Winkelstein JA, Marino MC, Johnston RB Jr, et al. Chronic granulomatous disease. Report on a national registry of 368 patients. Medicine (Baltimore). 2000 May. 79(3):155-69. [Medline]. Yang KD, Hill HR. Neutrophil function disorders: pathophysiology, prevention, and therapy. J Pediatr. 1991 Sep. 119(3):343-54. [Medline]. The authors and editors of eMedicine gratefully acknowledge the contributions of previous authors Naynesh R Kamani, MD, and Kevin J Curran, MD, to the original writing and development of this article.